Wilhelm Von Habsburg wore the uniform of the Austrian officer, the court regalia of a Habsburg archduke, the simple suit of a Parisian exile, the collar of the Order of the Golden Fleece, and, every so often, a dress. He could handle a saber, a pistol, a rudder, or a golf club; he handled women by necessity and men for pleasure. He spoke the Italian of his archduchess mother, the German of his archduke father, the English of his British royal friends, the Polish of the country his father wished to rule, and the Ukrainian of the land Wilhelm wished to rule himself. In this exhilarating narrative history, prize-winning historian Timothy D. Snyder offers an indelible portrait of an aristocrat whose life personifies the wrenching upheavals of the first half of the twentieth century, as the rule of empire gave way to the new politics of nationalism. Coming of age during the First World War, Wilhelm repudiated his family to fight alongside Ukrainian peasants in hopes that he would become their king. When this dream collapsed he became, by turns, an ally of German imperialists, a notorious French lover, an angry Austrian monarchist, a calm opponent of Hitler, and a British spy against Stalin. 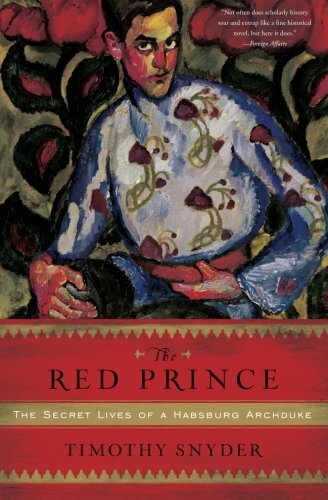 Played out in Europe’s glittering capitals and bloody battlefields, in extravagant ski resorts and dank prison cells, The Red Prince captures an extraordinary moment in the history of Europe, in which the old order of the past was giving way to an undefined future-and in which everything, including identity itself, seemed up for grabs. “Once upon a time, a lovely young princess named Maria Krystyna lived in a castle, where she read books from the end to the beginning. Then came the Nazis, and after them, the Stalinists. This book is the story of her family, and so it begins with an ending. An hour before midnight on the eighteenth of August 1948, a Ukrainian colonel lay dead in a Soviet prison in Kiev. He had been a spy in Vienna, working first against Hitler during the Second World War and then against Stalin in the early cold war. He had eluded the Gestapo had left half of his body paralyzed and one of his eyes useless. Retuning home after the Second World War, he tried to claim the family estate. The property was in Poland, and the older brother was Polish. Having been seized by the Nazis in 1939, the estate was confiscated again by the communists in 1945. Knowing that his family had a German background, his Nazi interrogators had wanted him to admit that he was racially German. This he had refused to do. Now he heard the same argument from the new communist regime. he was racially a German, they said, and so had no right to land in the new Poland. What the Nazis had taken, the communists would keep.